The Architects Act requires the Board to promote a better understanding of architectural matters in the community. To do this, the Board commissions research; develops teaching materials for school students in partnership with others; and provides support for exhibitions and events. 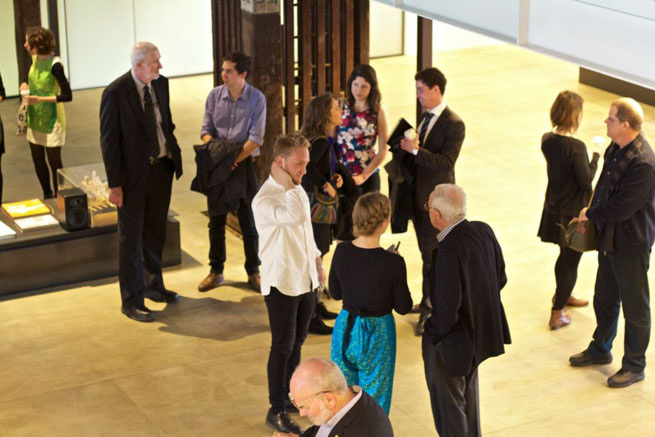 And we present the Sydney Architecture Festival in partnership with like-minded organizations. Our alter-ego is Architecture Insights - developed as a source of events and ideas about architecture. Change. Architecture. Discuss is a project that explores the future of architecture and the built environment in NSW and beyond. Since 2009, the Board has been proud to support the graduating students’ end of year exhibition at each of the four schools of architecture in NSW. These exhibitions are an important meeting point for students and their families, university lecturers, program directors and researchers, and the profession itself. It's an important milestone in the cultural life of the architectural community. As an independent statutory authority, the Board seeks to model an evidence-based approach to advising government and the community on architectural issues. We know design, architecture and the built environment are a significant part of the NSW economy so how do we make the most of our investment in the long term shape and character of our state? A 10 year commitment that celebrates the 40th Anniversary of Sydney Opera House and the special bond between Australia and Denmark that began with Jørn Utzon’s visionary design of the Opera House. Architects are skilled and experienced professionals. In order to be registered with the NSW Architects Registration Board, a person must have the prescribed university qualification in architecture, or other qualifications that the Board deems equivalent. Use this form if you have completed the AACA Architectural Practice Examination (APE), Locally Experienced Practitioners Program (LEP), the Overseas Architect Assessment (OAA) or have successfully completed the SAP (Supplementary Assessment Process for APEC Architects), but have never been registered anywhere in Australia or in New Zealand. Use this form if you are currently registered as an architect in another State or Territory in Australia or New Zealand or from approved jurisdictions in the United States of America and wish to apply for registration in NSW under the Mutual Recognition Act (MUTREC), the Trans Tasman Mutual Recognition Act (TTMRA) or the US/Australia/New Zealand Mutual Recognition Arrangements. If you are an overseas registered architect wishing to practise in the State of New South Wales, you can apply for registration in the temporary registration category for a limited period. Architect corporations and firms must nominate an architect, registered in NSW, to be its responsible architect in the provision of architectural services in NSW. Complete this form if your name has recently been removed from the Register for non-payment of annual renewal; or have not been on the Register for a period of time; or wish to transfer from Non-Practising to Practising status. This week the Architects Accreditation Council of Australia has launched the second phase of its major survey of architectural education and the profession in Australia and New Zealand, with the support of all architectural stakeholder organisations in Australia and New Zealand. After walking over 200km in 3 weeks, Byera Hadley Travelling Scholar James Masman shares his fresh insights about the unique character of Tokyo streets, and questions if innovative planning policy might be the secret behind these fascinating spaces. Byera Hadley Travelling Scholar, Ryan Wazir, sheds light on his current research that explores the opportunity for architecture and urban design to re-imagine contemporary design approaches to mosques, and continues an important conversation on how these disciplines can foster inclusivity, interfaith and intercultural dialogue. The Architects Medallion is awarded each year to a graduate of the Master of Architecture course from an approved school in NSW who has achieved distinction generally throughout the final two years of the course. We sat down with this year's winner, Eric Ye. The NSW Architects Registration Board will partner with the University of Technology, Sydney, to mentor up to 10 Indigenous students studying Architecture at UTS over five years as part of the remarkable new Droga Indigenous Architecture Scholarship. The Board has awarded the Architects Medallion since 1924 to a graduate of the Master of Architecture course from a school in New South Wales, who has achieved distinction both in a particular subject area at final level and generally throughout the last two years of the course. Over recent months, the Board has been working with the Department of Finances, Services and Innovation to remake the Architects Regulation. This Regulation sits under, and supports, the Architects Act. Contained within the Regulation are clauses that define architectural qualifications, course accreditation, and how Board members may be selected or elected. A new exhibition on European architects in post war Australia explores the contribution made by immigrants who were welcomed to a foreign land with new rules. “The Moderns: European Designers In Sydney” opened at the Museum of Sydney in July and will run until November 2017 thanks to Sydney Living Museums.